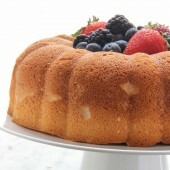 Light and airy angel food bundt cake paired with your favorite fresh fruit, roasted strawberries or whipped cream! It’s officially Summer! Hooray! Of course, isn’t it kind of weird how the beginning of Summer is practically the end of June? Seems odd. It should definitely start June 1 or at least around there… maybe even the last week of May, but then the kids in the northern half of the country would still be going to school when it’s Summer. They got lucky here and finished just before Summer started. I’m sure that hasn’t always been the case though. Too many snow days and the end of the year can get pushed back a ways! But let’s not talk about snow days when it’s gorgeous, sunny and Summer! But now that it’s Summer, you need cake. But not just any cake. Angel food cake. 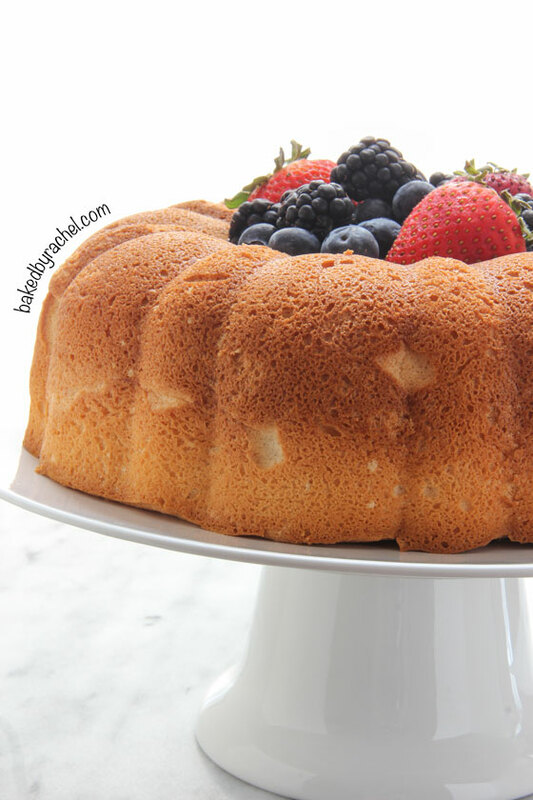 In case you don’t have a fancy schmacy angel food cake pan, this one uses a bundt pan! I did it this way because I figured, who really wants to buy a giant pan that you’ll rarely use for anything but angel food cake. Right? But almost everyone has a bundt pan. If you don’t have a bundt pan, it’s totally a worthwhile purchase because it can be used for all kinds of cakes… sweet cakes, savory cakes, breads, breakfast cakes, and so much more! See… bundt pans are where it’s at! Forget about that silly straight sided boring pan that’s just going to take up a square foot of space in your cabinet. That’s a huge chunk of space! 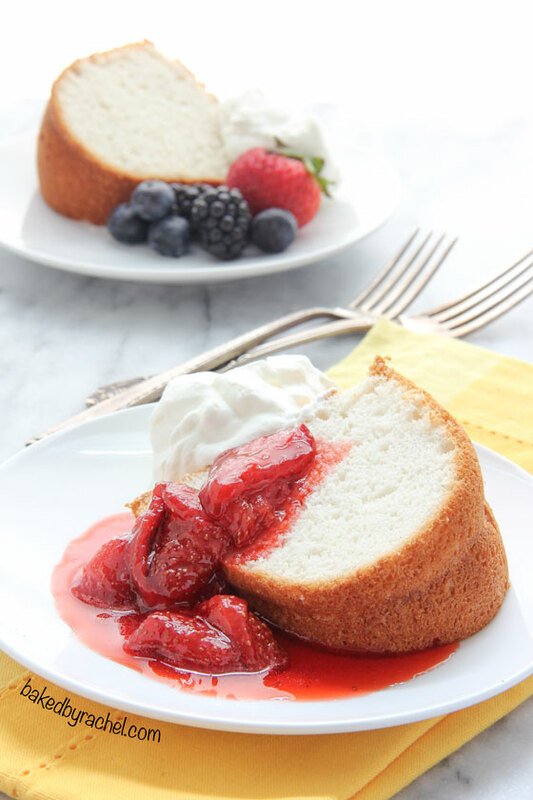 Angel food cake is a classic and is an absolute must every Summer. 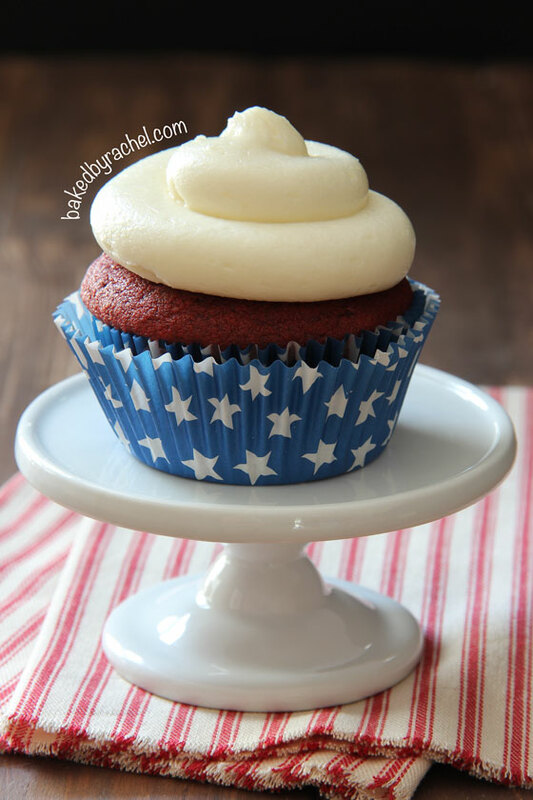 It would of course be perfect for 4th of July celebrations, topped off with your favorite seasonal fruit or roasted strawberries! So hard to choose which way to go, so you should probably offer it both ways. Just saying. Definitely assorted fruit… and roasted strawberries and especially with a generous helping of whipped cream. After you separate your eggs to make this amazing angel food bundt cake, be sure to save your yolks to make lots of homemade ice cream! Preheat oven to 325°F. Lightly grease a 10-inch bundt pan. In a medium bowl, sift together cake flour and powdered sugar. 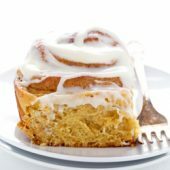 In the bowl of a stand mixer with whisk attachment, beat egg whites with cream of tartar and salt until soft peaks form. 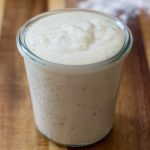 With mixer running on low, slowly add vanilla and granulated sugar, increasing speed and whisking until stiff peaks form. Fold in sifted cake and sugar mixture. Spread into an even layer in prepared bundt cake pan. Bake for 55-60 minutes or until golden brown and a toothpick inserted comes out clean. Cool in pan, on a wire rack. When cooled, invert onto a serving tray or cake stand. 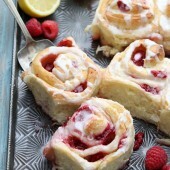 If serving with roasted strawberries; preheat oven to 425°F and add parchment paper to an rimmed baking sheet. 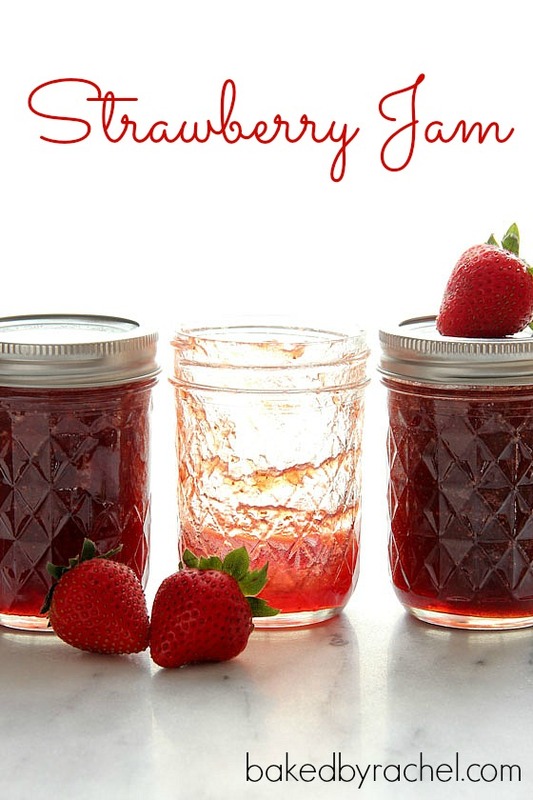 Remove stems and slice strawberries into 4ths. In a large bowl, toss strawberries with sugar and transfer to prepared baking sheet. Roast for 15 minutes. When cool enough to handle, transfer strawberries and juice to a medium bowl. Chill until ready to serve. 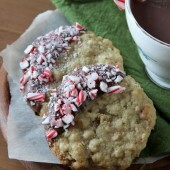 For the whipped cream; in a medium bowl, beat together heavy cream and powdered sugar until stiff peaks form. Chill until ready to serve. Recipe serves roughly 12-16, yields 1: 10-inch bundt cake. This is so pretty! I love angel food cakes especially with fruit on them. Making it in a bundt pan is a great idea. Your cake is PERFECT! Love it! Love this! So simple and yet so much flavor. The fruit makes it just perfect for summer! Love angel food cake! Looks beautiful. 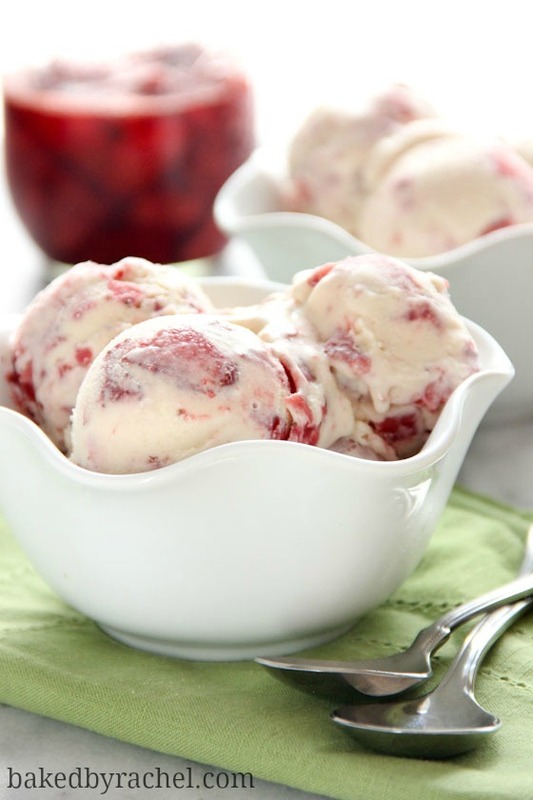 This looks great – one of my favorite summer desserts for sure. And I use my bundt pan for any kind of cake too – I’m not strict in my kitchen like that!! I definitely need to adopt putting fruit in the center of the cake for serving though – so cute! Stunning cake .I would really love a bite. 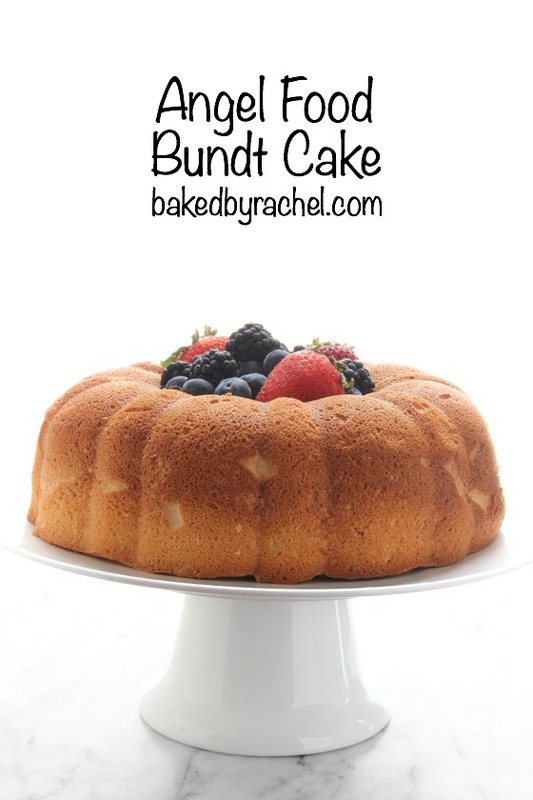 Love the idea of using a bundt tin to bake the angel cake. And now we need to force it to stick around longer than usual somehow! 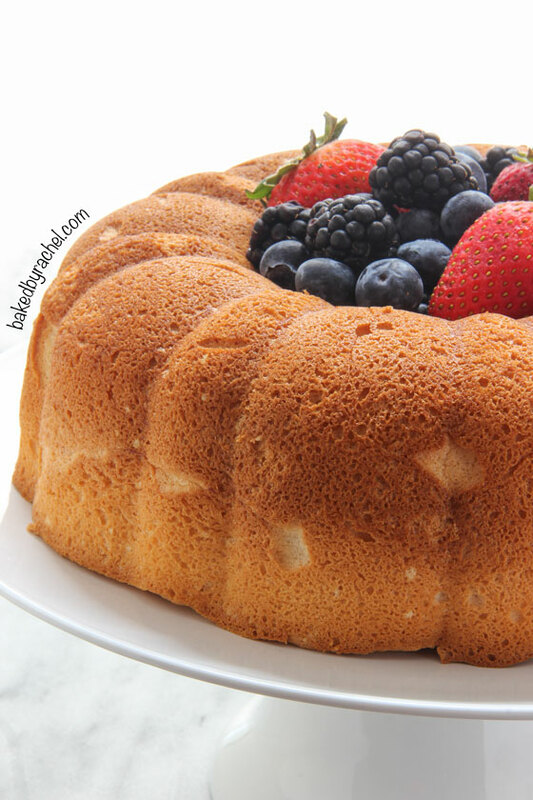 angel food cake is so perfect for the summer. 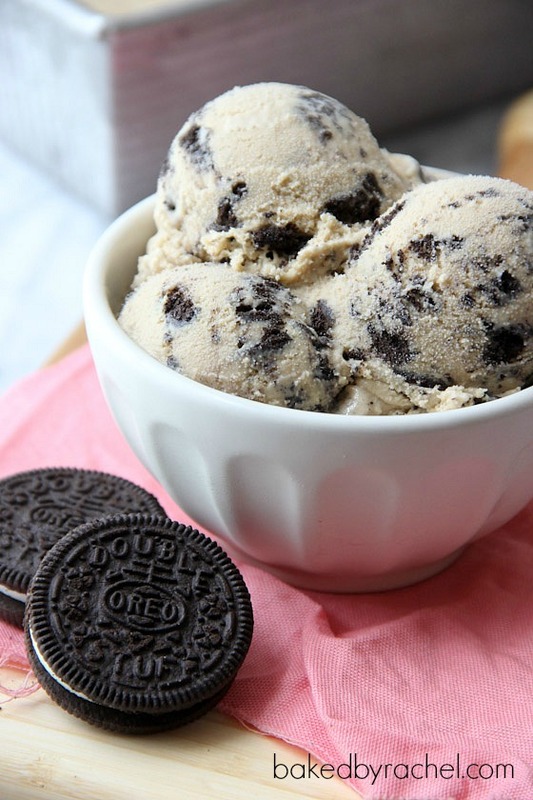 light and yummy!! Angel food cakes, while pretty and tasty, can be temperamental. There are two likely culprits with your cake. 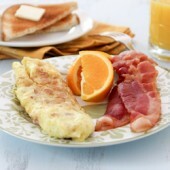 The first being you may have over whipped your egg white mixture or deflated it when combining everything. The egg whites need to remain fluffy and full of air. The other possibility is that your oven may be cooking hotter than you think, resulting in the cake setting before it had a chance to rise and set properly. 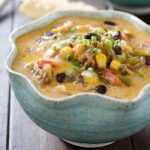 I only recently discovered your site and found this recipe while looking around. I’ve wanted to make an angel food cake but don’t have a tube pan. I also have a small kitchen and so don’t have the room for lots of different kinds of pans. Anyway, I just made this today, and it came out great. 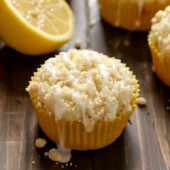 I made one small addition which was to add a little bit of almond extract along with the vanilla extract. It tastes great and has that nice light, fluffy texture. I’ll definitely be baking this again. I am going to attempt this lovely looking cake for a friend’s birthday, who loves angel food cake. But am curious (and wonder if it will really turn out ok) as to why you grease your cake pan when everything I’ve read about angel food cakes adamantly says NOT to grease the pan. I only have a very old bundt pan without non stick coating so was looking for a recipe where I could grease the pan. Fingers crossed!! I honestly had never heard that about not greasing a pan for angel food cake before but, it worked beautifully for me. I didn’t have a single spot stick to the pan. 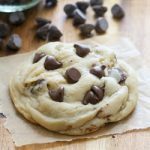 Just be sure to use a baking specific spray that includes flour. Good luck! I, too, wondered about greasing the pan since every angel food cake recipe I know of says to invert the cake while you cool it, that helps keep the volume up and the cake light and fluffy. One would think the cake would slide right out of a greased pan. Do you invert your angel food cakes while cooling? As mentioned in the instructions, it is cooled in the bundt pan and then inverted to finish cooling. When using a bundt pan for angel food cake, it is necessary to grease the pan and cool as directed for best results. Because of the difference in construction between the two pan types, they require different processes. The cake looks lovely I definitely want to try it but the problem is cream of tartar is unavailable where I live and I can’t find vanilla extract either can I use tartaric acid instead of cream of tartar and essence instead of extract? 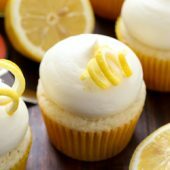 Some suggest to use 1/2 tsp lemon juice per egg white, instead of cream of tartar. 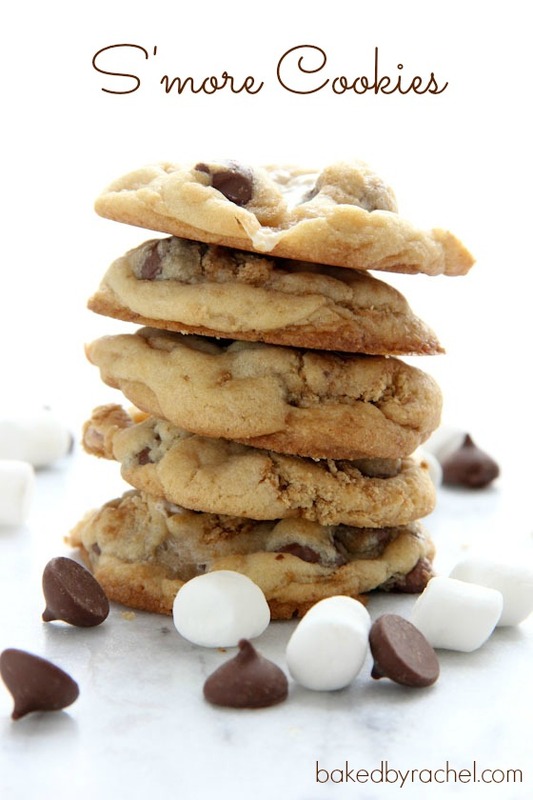 While others suggest a mixture of baking powder and baking soda. You may need to experiment to see what works for you. As far as the vanilla essence goes, it has a different alcohol content than that of vanilla extract. You may want to start with a smaller amount of it and see what works best for your taste preferences. You can always add more! Good luck!! Hi Rachel! This cake was delicious! It came out a little too dense – but maybe that is because I whipped the egg whites in a food processor instead of whisking it. I will need to invest in a stand mixer one of these days. Thanks for sharing! Hi Rachel, I love this recipe but I struggle to get the cake out of the baking tin. I have tried everything, the cake is perfect but the golden brown outside is always stuck on the pan. someone told me to try cornflour – but that didn’t work. please could you assit? Bundt pants need to be greased well prior to adding any filling. 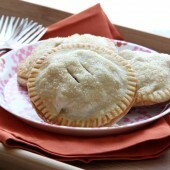 Use a baking spray that includes flour or butter the pan and dust with flour, shaking out any that does not stick. I don’t know why you would grease the pan at all. Angel food cake needs to climb the pan so it can become light and airy. Ugh just tried this recipe and it did not work. At the beginning it was rising and then it fell 😢. What did I do wrong? It sounds as though you may have over beaten your egg whites, which will cause them to deflate.